Leading Manufacturer of mel-05 type load cell, mpb type load cell, tension control sensor transducers, tension transducer, web tension transducers and web tension load cells from Jaipur. The Horizontal Pillow Block Series load cells for the web processing industries have the same dimensions as conventional load cells and mount in the same way. 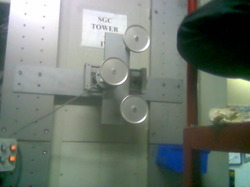 But they measure only the horizontal force component of the web tension. Unlike load cells that measure along the vertical axis, they are not forced to sense the roll weight along with the web tension. So these load cells can be sized to the tension level alone, and function at the high end of their measuring range, where load cells perform best. The result: always optimal tension measurement performance – even when rolls are heavy and tension light. # Suitable for both live and dead shaft rollers. # Built-in low friction, self-aligning bearings. # Suitable for both live and dead roller applications. 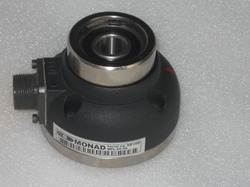 Monad electronics combines precision strain gauge force transducers with dead shaft mounting options to produce the highest accuracy for direct on line sensing of tension in moving paper, films, foils, wires and cables. Monad transducers, developed for web tension applications, incorporate a differential bending beam design with a full Wheatstone Bridge strain gage configuration. This design provides stable, accurate, and repeatable measurement over a wide range of operating tensions while virtually eliminating temperature drift. All capacities are equipped with mechanical overload protection. 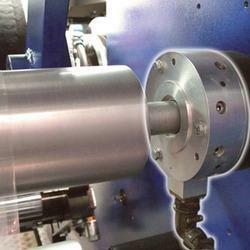 Available with a mounting configuration for dead shaft applications (with horizontal or vertical support surfaces). 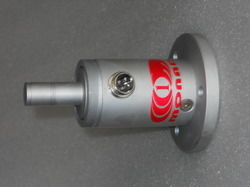 Monad Web Tension Transducers measure web tension forces applied across a roll, using integral horizontal and vertical axis sensors. This innovative and exclusive two-dimensional approach to web tension force measurement enables accurate determination of the true resultant force, as well as the applied angle. Not only does this permit installation and measurement at any mounting angle or roll orientation, it also combines to form an expert diagnostics system that produces the highest level of web tension measurement confidence available today. Looking for Web Tension Transducer ?